Right now, bus operators can’t be forced to run any service, and they set the fares, but in the next year, we have a huge opportunity to change this wild west scenario. Greater Manchester Mayor Andy Burnham is deciding now whether to pick a better way of running the bus network, re-regulating it, which puts buses back into public control. 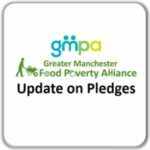 37% of Greater Manchester’s job seekers said that lack of access to transport is a key barrier to getting work, backed up by JRF research in low-income neighbourhoods in Manchester. This is in one of the UK’s biggest and best city regions. People from the poorest fifth of households catch nearly 10 times as many buses as trains. For lots of us, without a bus we’re stuck. Across Greater Manchester, many reported that cars and trains are simply out the question in terms of price. However, with buses their last option, they highlighted how expensive fares and unreliable services prevent them from taking up positions, and how the un-joined network can mean commutes of over three hours a day (over Jobcentre Plus’ limit for reasonable travel). Our bus network is not serving us. Instead people are being locked out of opportunities for work. With re-regulation, or franchising as it’s known, a fully integrated and planned network across GM’s 10 local authorities could connect us to our work places, our loved ones and the services we need at affordable fares, as we see in London. Plan and expand the network – Profits from busy routes could subsidise less busy but needed services. 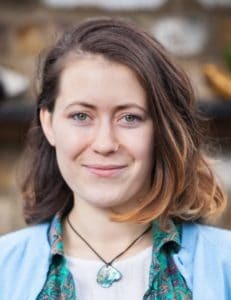 Right now, bus companies cherry pick only profitable routes and make a killing, but local authorities could use profits to give everyone a better service. Make buses affordable – Income could be used to lower fares, which have increased 55% above inflation in the last ten years. Make buses reliable – Bus companies would have to share data – meaning buses don’t disappear from the time table or app. Make buses frequent – Income could also be used to provide evening and weekend services, like we had before. This would transform buses for a lot of us. Re-regulating in GM would set a precedent across the UK for a bus network that serves people, not profit. We’ve launched a petition calling for re-regulation and it already has over 5,000 signatures, but we want twice as many so please sign and share the petition to join the call for better buses. Right now, we have a postcode lottery and a poverty premium, with richer areas often getting the better routes and cheaper fares, at least during commuter hours. Public money is used wherever possible, to plug gaps where there is need, however this is an inefficient use of public money. 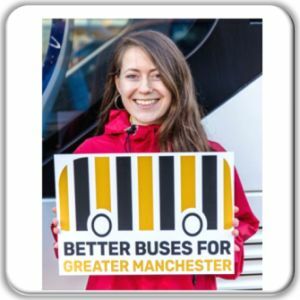 Better Buses for Greater Manchester found that on average £18 million a year is going to shareholder pay outs in the North West region. 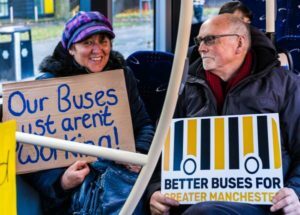 Re-regulating our bus network would mean that Greater Manchester could have publicly controlled buses which connect communities to where they need to be. We’d also love to hear from you. 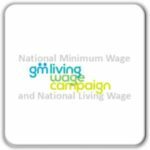 We need organisations, businesses and groups to pledge their support for the campaign. 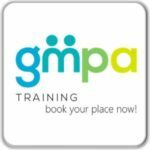 Whether you can offer your logo to show support, as GMPA have, or your time, or both, we need as many people speaking out for better buses as possible.